When I’m not writing, or spending time with the family, I’m geeking out in one fashion or another. 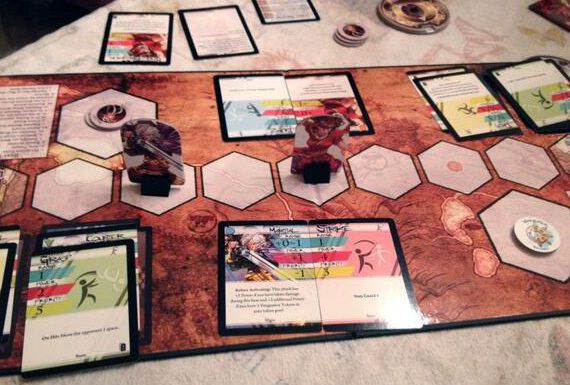 Last Saturday was International Table Top Day, a day to celebrate a quintessential form of geekery – board games. After a late night writing session around midnight, a fellow author and I decided to kick off celebrations early. I mean, you can’t claim to be a true connoisseur of geekery unless you are up until all hours of the night funking up a room and slamming caffeine. Of course, it was my house after all, so I hung a tree on the chandelier and we got to work. GET OVER HERE! Oh…wait, I read the range wrong. If I’d simply read about Devastation of Indines, I’d probably have given it a pass. Anime along with Street Fighter type games, while fun, aren’t really my preferred form of social suicide. In Indines, you control an anime character in a duel. Each character has a distinct style represented by cards which you play in conjunction with a base card to create combinations. A simple flip and reveal mechanism and comparison of the numbers provides the basis for resolving actions. Each character also has abilities which they can add to their maneuvers and an ante system gives players tokens they can spend to charge these abilities. I played a character with a defensive counter striking powerset and my opponent was a nimble striker. I did well until I completely misread my range during one round and pulled the equivalent of “attacking the darkness”. Still, the game ended very close with the striker eviscerating me final turn. The game has many other modes – team play, co-operative versus Big Bosses and even allows for solo play. The base set also included around thirty unique characters with their own styles and abilities making for excellent replayability. I’m looking forward to trying that one again. The next morning, I dragged myself out of bed and headed to the local game shop to play a few other board games – one new and one already a classic. Tsuro is a tile placement game where you take on the role of a dragon soaring through the sky. With each tile, you place a path and must follow one of the swerving trails. You keep playing until everyone has flown off (or been forced off the board) and the final player is declared king of the swirly-tile-land. I prefer my games to be a little denser in strategy and rules but it was the perfect appetizer for the next game. Apollo, Starbuck, do you copy? 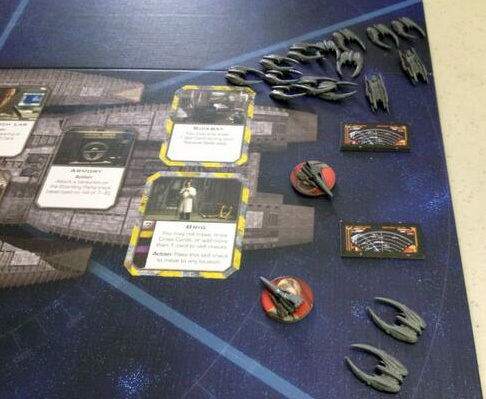 I’ve never played the Battlestar Galactica board game but it has become legendary in many gaming circles. Even after a three (four?) hour session, I’m not sure I can claim to have truly played it yet. The rules aren’t necessarily complicated, but there is a lot of turn order fluidity that can really confuse you on your first time through. Generally, I don’t like games where they provide a token to track player turns because you KNOW there is going to be a lot of out of sequence events going down. This one is maybe worth the hassle though. At the start everyone picks a human member of the crew and is given cards to indicate whether they are in fact, a disguised cylon agent sent to destroy the humans. Due to my noob status, Admiral Adama (me) was apparently soooo unhelpful, Baltar wasted his once per game ability to check if I was one of the fracking toasters. I wasn’t. I just sucked. For the entire game, we’d been set upon by basestars and raiders only to find out that not one but BOTH of our pilots were skinjobs (I had one pegged, but didn’t want to believe both pilots were compromised). By the time that information was revealed we were already limping through space, half-starved, down to enough humans to fill a phone booth and several jumps away from Kobol. I will play that game again and seek VENGEANCE. Or maybe pursue some weird ending where my character transcends the whole conflict and magically disappears. ITTD is the brainchild of Wil Wheaton, formerly the most annoying STNG cast member, and now highly-regarded gaming ambassador. If you haven’t already, check out Tabletop season 3’s fundraiser over at Indiegogo.